The world today is becoming increasingly self-centered where empathy, compassion and humanity are fast losing ground. Now, more than ever, there is an urgent need to show our children how to ‘walk the talk’ and do something positive to make their world a better place. Schools in urban and rural India are very different in facilities, infrastructure and the quality of learning and education. We may have different perceptions of what a school should be like as we demand many facilities in urban schools but most rural schools lack even the basics. Nevertheless brilliance, achievement, innovation and excellence are neither the exclusive domain of cities nor villages. What is ‘School to School’ (S2S)? S2S is about addressing the educational needs of thousands of schools, aanganwadis and informal teaching centres in remote, resource-starved villages or slums by channelizing under-utilized school material from city schools in a dignified and impactful way. It is a cost-effective and easily replicable concept, which makes the city students more aware and empathetic about the lives of their rural counterparts. In the schools of village India, Goonj’s quest is to use material not only to address ignored learning needs but also as a tool for behaviour change. We all know that children are very impressionable and receiving material as ‘charity’ to fulfill their needs leaves a negative impression on their self-respect and dignity. S2S instead uses urban school material as a reward for positive behaviour change on issues like hygiene, attendance and learning among rural children. Goonj works across India with hundreds of villages and slum schools, aanganwadis and informal learning centres and hostels. Here are three heartwarming stories of hope from schools in the deep interiors of West Bengal, Uttarakhand & Bihar. These are the stories of how material can be used as a transformative force. Andharisole village is located on the barren tribal belt of West Medinipur district in West Bengal. As one walks along a narrow kachcha (rough) lane, you reach what looks like a picture-perfect school of children’s drawings. It is clean, properly fenced with pictures on the wall, a green kitchen garden with a lot of flowers and properly dressed kids. The school boasts of 100% enrollment from tribal kids, some of them being first-generation learners. It wasn’t always like this. Established way back in 1979, a School Inspector (SI) only recently visited this school for the first time. Today, it stands transformed as a model school, a beautiful example of how long-lasting changes can be brought about using urban underutilized material as a tool. “Material support is necessary to secure student participation & community involvement” shares Harish Chandra Bera, head teacher of this government primary school. He played a critical role in the gradual process of behavioural change with material as motivation. It started when we first established a proper library here and gave the responsibility for its maintenance to the school. When this endeavour succeeded, Goonj provided the school its first computer while an exposure visit was arranged for the school head teachers to some of the best Kolkata schools (with the support of partner organization KJKS). Changes were soon visible as the students gradually got involved in the day-to-day activities of maintenance and cleanliness. It started with simple things like inculcating hygienic habits like washing hands before and after meals, proper use of toilets while keeping them clean and encouraging segregation of waste as biodegradable and non-biodegradable items. The ripple effects were soon visible on the local community as well. People cleared up the path to the village and used the cut down bushes to build a boundary fence for the school. They also made a school kitchen garden (currently providing nutrition for 66 students) with Goonj ‘Family Kits’ as reward for their efforts. Today, the school has a student council of its own, with a ‘Prime Minister’ and other ministers looking after food, health, sanitation, sports, cultural and other miscellaneous activities. The children also maintain a ‘herbal medicine’ garden growing more than 30 types of herbs apart from running an indigenous seeds collection centre in the school. In the process, the overall interest and involvement of the parents in their wards’ studies and their connection with the school has improved a lot. The village head promised to include the school’s fencing under Mahatma Gandhi National Rural Employment Guarantee Scheme (MGNREGS). 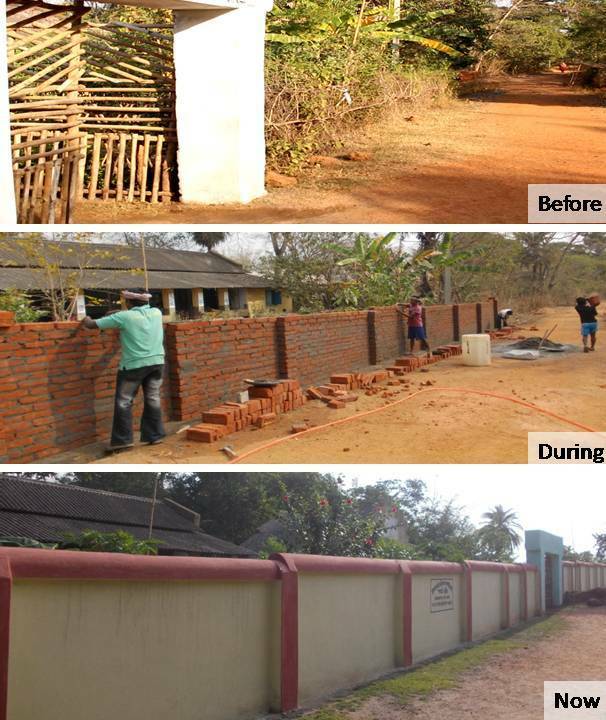 In April 2015, the fence was turned into a brick boundary wall with the panchayat (a village council) funds. It shows that when a community works on its own problems, their voice demanding their rights becomes much more powerful. Every year the school gets a sum of ₹10,000 under the Sarva Shiksha Abhiyan (SSA) for maintenance etc. With their major school material needs addressed by Goonj, this money was freed up for other infrastructural work like acquiring wash basins, taps etc. Child development specialists say that the environment and general awareness a child gets in his or her early years leaves a lasting impact. The primary school in Andharisole does not boast of air-conditioned classrooms or horse riding lessons but what it is giving to its students is perhaps something all of us would want for our children to imbibe. Dedicated teachers like Harish make a big difference in the quality of learning for their students who also took the initiative to change their own learning experience. The good news is that this is not the only school transforming its own story.. In 2015, parents started withdrawing their kids from private schools to enroll them in the government school in Munakot block of Pithoragarh! This is a rare phenomenon but that’s because this government school is unlike any other. It was awarded the first prize in sanitation in the state, racing ahead of many other big names. The credit goes to Chandra Shekhar Sharma, the school headmaster, whose tenacity paid off. All he needed was a little support to pursue his goal of making his school the best in the area. From July 2015 when the local Goonj team started reaching necessary material support to this school, the impact was soon visible. Now the school has a small library, a computer centre and the kids have enough to wear and play leading to a hike in attendance. One of the things that clinched the first prize, were the hand towels each student had (provided by Goonj) !! Sounds strange? Small things do matter!! This school in Gauri Belawa, was basically a group of 100 children sitting under shade in a mango orchid. They suffered every season of the year-scorching heat in the summer, bone-drenching wetness in the monsoons and shivering chill in the winter. When the principal met us and shared these problems we encouraged 92 villagers from the area to build a basic school structure. They went one step ahead, collecting bamboos and other raw material, cutting down bushes, leveling the ground, constructing a 15×50 ft long cottage and a 15×18 ft kitchen for preparing and serving food to the kids. They also leveled the mud outside the school to make a 130×50 ft playground. Pleasantly surprised by their own strength and ability in solving their problems without depending on any outsiders, the villagers soon had a school ready for their children!